The lavalier or lapel mics are the most popular mics to be used with DSLR cameras for video production. Saramonic UwMic9 and Sennheiser AVX MKE2 are the excellent mics preferred by most of the videographers. If you are doing any interviews, tutorial or training videos for YouTube, having a lavalier mic in your DSLR kit is essential. 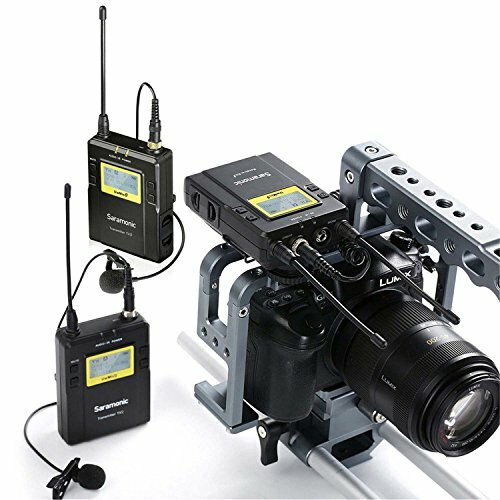 Although there are many wireless lavalier mics, only some of them are supported by your DSLR camera directly. Some of the others need a separate DSLR audio adapter. The lavalier mics are popular among the professional DSLR video producers because they have a small footprint and some can be easily hidden behind your collar without any noise while doing portrait videos. Lavalier mics come at the price of as low as below 30 bucks or so. Some low-quality omnidirectional mics tend to pick up lots of noise especially after some months of use. In that case, you may need to remove the noise using some software like Audacity thus sacrificing low-frequency details of the vocals. I suggest you go for mics that are at least under $100 (if you are on a budget). If you are going for wired lavalier mics, then you may also want to consider the cord length. The short cord length may limit the distance from which video can be shot. Rest assured; you can always make use of an extension cord in case if the cord is too short for your video recording use. Some of the lavalier mics can easily hide underneath your shirt. But the problem is that in this case, the mic tends to pick the noise of the rubbing with the shirt. There are some lavalier mics which can be hidden from the frame while recording video from your DSLR. Lavalier mics require an extension cable in case if you are shooting the video from a distance. 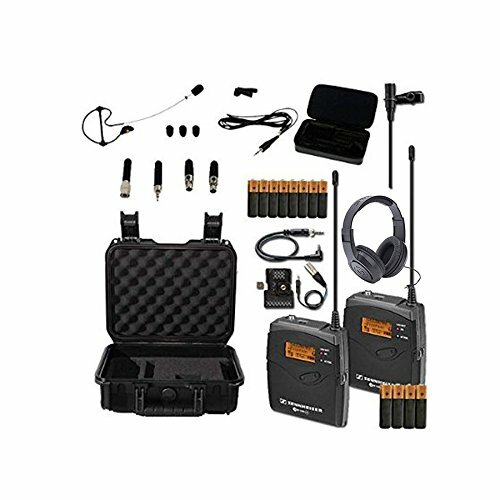 However, the wireless lavalier mics get you rid of any wires and thus suitable if you wish to shoot the videos hassle-free. The wireless mics also come with wireless transmitter and receiver. The transmitter device is the one that you fit at the back of your belt. Due to the technological improvement, there is no big difference between the recording quality of wireless and wired mics. The most popular lavalier mics are wireless. While opting for them, you need to check out the mic operating range. The 250 ft range would be ideal. Considering all the aspects that I've mentioned above, I've chosen some of the really good lavalier mics that can compliment with your DSLR for good quality sound recording. For a good wireless mic that has the same quality as this, it will cost you above $500 (look at Sennheiser and Sony ones). But for below $300, this Saramonic UwMic9 mic is an absolute steal. Let me explain the reason in detail. First, when you open the box, the first thing that you notice is that how durable they are. They are built with a solid block of aluminum. Also, this solid build ensures durability of the mic and the components. You also notice that the receiver also includes a belt clip which would be handy if the photographer is willing to clip-on the receiver to his pant belt. 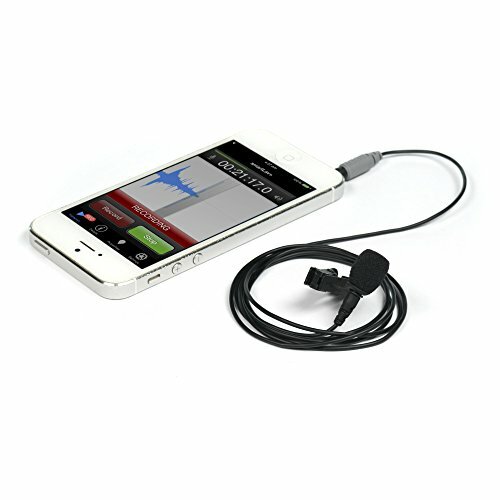 The package also includes another cable, which enables you to use the mic with your mobile devices. As the iPhone and android users are increasing nowadays, I prefer you to get the mics for iPhone while recording. You also notice that the receiver also includes a belt clip which would be handy if the photographer is willing to clip-on the receiver to his pant belt. The setting up of the system is straightforward; you can anyway go through the user manual, and it is a matter of 2 minutes or so to set it up. As like that any other lavalier mics, these are omnidirectional. You need to configure your levels right for it to reject ambient noise and focus on the subject's voice. However, note that the sounds that are too loud are not rejected automatically like other lavalier mics. Want to know more about Saramonic UwMic9? Both the transmitter and receiver comes with LCD, which displays useful information along with a bunch of buttons for settings. The mic also supports XLR transmitter options. The XLR cable is also included in the package. The battery life of the mic is mediocre, but unless you have long outdoor sessions, this won't be a problem. This mic is not to be confused with the Sennheiser AVX Handheld mic. This MKE2 is a wireless lavalier mic. The size of the lavalier mic is very small when you compare it to the previous version that is ME2. This means you can easily hide it on the plain sight. The footprint is even smaller than Rodelink. MKE2 bundle comes with lav mic, four miniature screens (which change the decibel levels), deadcat, two cable clips. The receiver sits right on top of the camera on a hot shoe connecting to the audio-in/mic port of your DSLR. It comes with both XLR and mini out jacks. You need to wear the lav mic and also fit the transmitter to your belt or in your pocket. The battery on the units charge over the micro-USB, this is something which is great. The transmitter and the receiver auto pairs the moment you turn them on. This mic picks up less noise from the surroundings than at least the previous version, thanks to the background suppression. The range of operation is around 200 feet in city environments and can go upto 270 feet in a field. If you see, the sound quality of MKE2 is significantly better than the previous ME2 which is a hundred bucks cheaper as of writing this review. It is even better than the Rodelink when it comes to clarity of the vocals and warmth. But you are the one to decide, whether the additional dollars is worth it for you. You can also use these with your smartphone with a Sennheiser KS 600i TRRS adapter, which is pretty impressive. It is one of the best lavalier mics for DSLR filmmakers. This mic comes with a transmitter, receiver, lav mic, foam, and a cable 3.5mm (coiled form), etc. On the top of transmitter, we have a port for the mic and also a power button. To mute the mic, you need to hold the power button for a couple of seconds. It has also got a USB port on the side. The receiver has got the round hot shoe adapter at the bottom. Top of the unit contains the power button, and display with a channel, battery status, levels, etc. Other buttons include channel selection and also the mute button, On the side, there’s a port for the cable. It needs two AA batteries to be powered up, you can also make use of micro USB cable for it to work. Overall the sound quality is great for the price. The frequency range is 60Hz – 18kHz and it has an output impedance of 3000 ohms. It is a condenser mic, and if you compare this mic with others in this range, this mic offers a good signal-to-noise ratio. It also features one-touch pairing. It is an omnidirectional condenser mic, that means it can be pretty bad at the high-noise environment. The sound quality will be top-notch when used indoors than outdoors. In order to get the best quality, you may need to use this mic-less than 7 inches from the talent’s mouth. Sennheiser EW 112P G3-B is the best wireless lavalier mic you can get today. The beauty of this mic is that it works even when the subject is 630ft away from the camera. As you may expect, the sound quality drops a little after 130ft. You don't need any Juicebox to run your mic through. This mic works great right out of the box just by plugging into your DSLR. You don't need to fiddle out with settings, as the mic has Automatic frequency scan feature. This feature is meant to avoid interference at any cost. 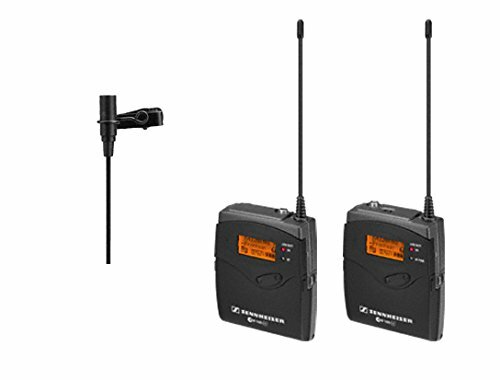 The main difference between these and other cheap wireless lavalier mics is that the latter ones often cause interference. This mic comes with 12 compatible frequencies, and it will automatically set the frequency. The mic's transmitter that you mount onto your pant belt also comes with a convenient mute button which is very handy if you are willing to mute the recording for a few minutes or so. It also saves you a lot of battery while recording preparation. 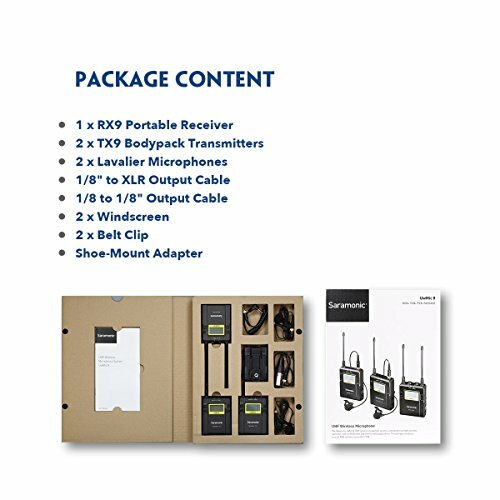 The mic package comes with the mic, receiver, transmitter, output cable, XLR cable, camera adapter, and the batteries. The mic works great for up to 10 hours on a single charge, which is great for a wireless lavalier mic. The battery level will also be indicated on the LCD. In this regard, there's nothing to complain whatsoever. Obviously, you can adjust the gain and other settings so that the recordings match your taste. The build quality is excellent, and these are solid for outdoor use. The vocals turn out to be crystal clear with no noise whatsoever. It's absolutely worth the price. 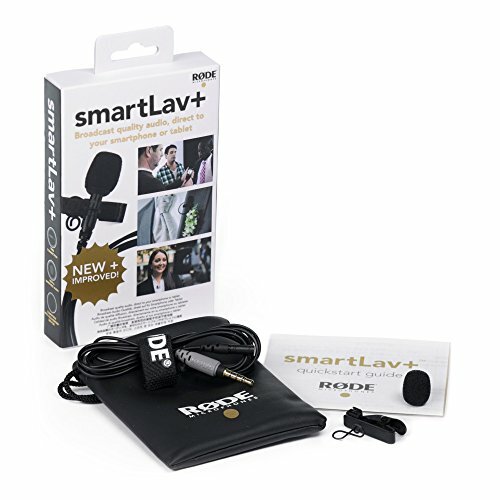 Rode smartLav+ is one of the best budget lavalier mics. You can get for your video production or even use with your smartphone. The mic can be used with your DSLR with the help of Rode SC3 adapter. If you are looking for a good cheap mic, without going for high-end wireless lavalier mics, this mic will delight you by adding professionalism to your videos. In spite of being an omnidirectional mic, the noise reduction is great. For an audiophile, this may seem a little noisy but not in all the cases. As like that many of the entry-level lavalier mics, the low-frequency range is a bit lacking. However, without this lacking, noise reduction would not be that great. So, no worries. This would not affect you at all as along as you are recording only your voice. If you are a vocalist or a podcaster, then don't forget to have a mic for recording voice overs. You can also use these mics in your live concerts as well. In case if you have your own YouTube channel, then to do commentaries you will definitely need a good mic. The stock cable that this mic comes with is only four ft long. But you can always use an extension cable for shooting distant videos. While opting for an extension cable, make sure you buy a good branded cable to avoid the noise in the recordings. The stock cable is Kevlar-reinforced. This means that the mic offers you good durability and sound quality. If you are willing to replace the DSLR's default audio quality with a better one, these Audio-Technica ATR-3350 are for you. These operate at a frequency range of 50 – 18,000 Hz. These are wired mics; it means you may need an extension cable to use it outdoors. Since this is a condenser mic, it needs a small battery as a power source. It offers a battery life of 4-5 hours which is great. Although the sound quality doesn't get nearer to the professional mics with XLR input like Sennheiser G3-B, this is more than enough for good quality recordings with less ambient noise. The low-frequency sounds are not picked up pretty good. Nevertheless, this is great if you use it for only vocal applications like podcasting and video production by rejected unwanted low-frequency ambient noise. While recording audio with this mic, you need to make sure that the mobile devices are at least 10ft away from the mic, or else in some of the cases, you may get some interference noise. The mic has a handy on/off switch which helps you preserve the battery life. 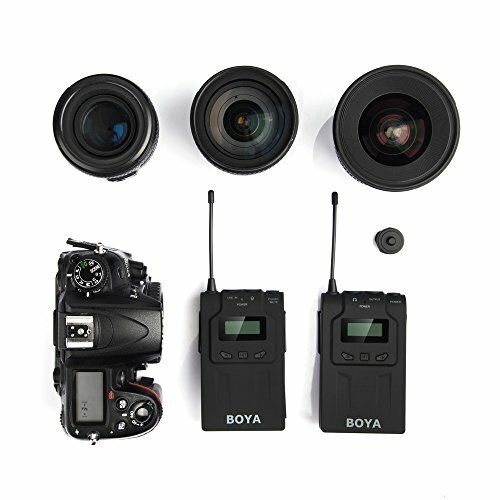 This BOYA BY-WM6 is a lavalier mic especially meant for DSLR cameras. The mic also comes with transmitter and receiver that can be powered with the 2 AA batteries and enables the mic to work for 8 hours. The mic is functional for up to 100 meters without any noticeable loss in quality. The sound quality is excellent without any static noise and interference. Although you can't expect the sound quality to be highly professional like that of Sennheiser G3-A, this mic is a good alternative to the inbuilt mic that comes with your DSLR. Ensure that the volume of both the transmitter and receiver is low, so that the mic won't pick up lots of noise. The voice quality is amazing, and adds a professional touch to your recordings. The mic is good at rejecting ambient noise when the volume is low. The components of the transmitter and the receiver are very light weight. This enables you to comfortably mount them to your pant belt all day long. 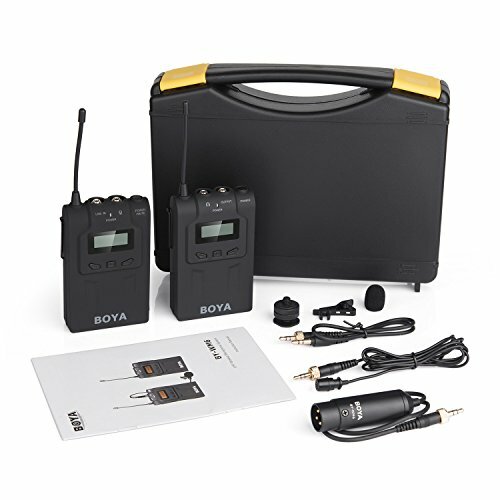 BOYA BY-WM6 is suitable to be used for recording vocals with DSLRs and not for use with GoPro cameras. These are some of the best lavalier mics for DSLR that you can buy right now. Although you may make use of shotgun mics with DSLR, in some of the scenarios using lavalier/lapel mics is most ideal. The positioning and convenience to move while wearing lavalier mic are much easier. Hope you found the blog post on lavalier mics helpful in DSLR video production.